— I wrote several times about my healing process, in a series of updates, in the weeks and months post-op. I am much improved since those early days, but am still awaiting the final version of the obturator that will blend in more naturally and allow me to laugh the big laughs without being self-conscious. As soon as I get the long-awaited appliance with tinted gums and lovely matching teeth (that is, teeth in the same shade as my natural ones), I’ll be writing what I hope to be the last installment of this crazy adventure that began on March 1. –Once I was able to swallow normally and avoid the sting of alcohol, I got back to writing my Ms Barstool columns for www.berkeleyside.com. It took me a while, but I’ve enjoyed getting back on the bar stool and back to work, if you call that working. –The trip to Antarctica may not have inspired much writing, but I loved capturing the beauty of the ice formations. And if one picture is worth a thousand words, then the math is kind of impressive. –I started writing for a new (to me) publication called Collegiate Parent (www.collegiateparent.com), and have had two articles published there. I loved most of the work I did as a college counselor, and this gives me an outlet to further explore the subjects of interest to parents of college kids today. –The one piece I submitted to Purple Clover was published this year, and I’m mentally composing a list of ideas for the future. I love writing for this site. 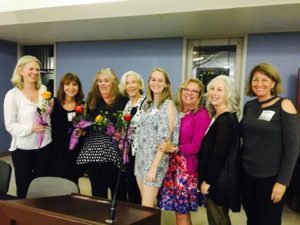 –After years of wishing and hoping, I was invited to participate in a panel with a celebrated group of local women writers (including Erika, mentioned above), and read an excerpt from my memoir, There Was a Fire Here. The reading occurred between the fires to the north and the more recent fires in Southern California. The timing was coincidental, but the fires were on everyone’s minds that evening. Thanks to EBUG for granting this wish! — And I was delighted to have my book, published in 2016, reviewed here. My thanks to Elizabeth Fishel and Wendy Martin for their support, encouragement, and kind words. –Once again, I had the opportunity to attend and then write about the Telluride Film Festival at EatDrinkFilms.com. The article is embellished with trailers and such. Some of the films are out now, but a few are not. Sneak previews! — A humor I piece I submitted (and nearly forgot about) was selected to be included in the Erma Bombeck Writers’ Workshop humor anthology, available next spring. I’ll be attending the EBWW this April, giving me the opportunity to hobnob with fellow (sister?) writers and meet more contributors, while surrounding myself with some terrific folks who also love cake. –When people ask me what I’m working on now, I again borrow from a fellow (and there must be a better word!) writer, and say “I’m composting.” Thanks, Mary Volmer, for making it sound like staring at a blank screen or looking out the window is part of a process. As I look back over the year, I can see that a lot of energy was expended off the page, what with one thing and another. I hope that in the coming year I’ll be able to focus outward, keep moving, and find more outlets for writing. Also: stay/get healthy, think positively, and find the words I know are here, waiting to be discovered and shared.